Jaap specializes in group dynamics and collective wisdom as expressed in his book World Wide We (2004) . He trains supervisors, executive coaches and leaders both in the UK and abroad. Jaap is an experienced supervisor working with individuals and couples. He also counsels individuals of all ages. Jaap lived for many years in Amsterdam and received his major training from Thale Bout, one of the first successful personal development trainers in the Netherlands. He also published a cookbook to ‘awaken’ the stomach (The Tao of Mashed Potatoes,1999). He has a B.A. in Cultural Anthropology and in Religious Studies and is an accredited Interfaith Minister. Next to this he trained as a psychosexual and relationship therapist in London. His approach to counselling is to use creative tools to support personal enquiries at ever increasing depth to accomplish continuous development. 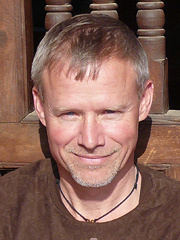 Transpersonal Psychology adds important perspectives to Jaap’s work as a counsellor.